Inspired by an old-fashioned shaving brush, the Waxwell™ features a shorter handle so that the brush fits into tight areas. The shape is ergonomically designed for comfort throughout long projects. The entire brush (handle and bristles) is about 6.5 inches long. BOTH the Large Waxwell and the SMALLER Waxine have the SAME SIzE handle. 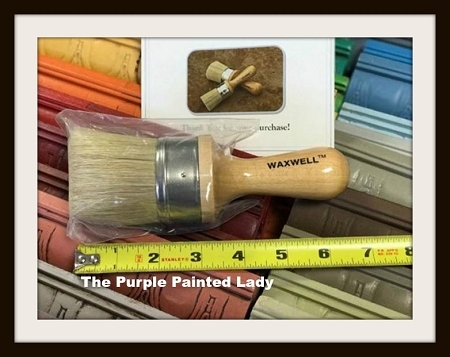 The difference is in the size of the diameter of the brush itself.The two-inch long and almost 2.5" wide natural bristles are firm and resilient and designed specifically for wax. 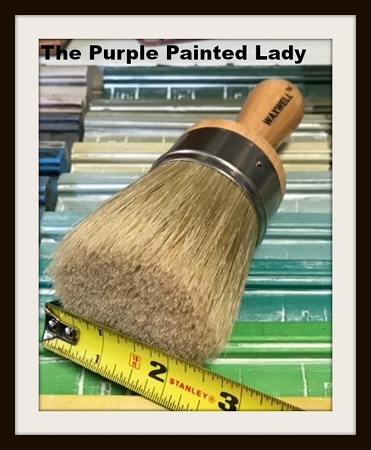 The flat bottom design makes it the perfect brush for clear wax over absorbent Chalk Paint® and milk paint as it helps massage the wax into the paint with little to no waste. Prior to assembling, the high quality white bristle is sifted to remove “micro hairs”. After the brushes are glued with extra strong epoxy, the rust resistant nickel plated ferules are hand nailed for extra stability. Then the brushes are cleaned and hand combed to further reduce shedding.